Discussion in 'Norton Commando Motorcycles (Classic)' started by Pete Komarek, Mar 28, 2019. - Cams were fine when I rebuilt the top end. -Appeared on the right side so ignition or carb, I have good spark. -Left side black plug from idling, right side black to brown. -With choke it runs pretty good, w/o choke boggy. -Lucas Rita ignition- pulled the cover and checked the clearance of rotor to pickup-.008" one side, .016 other side. Would the difference in clearances cause a poor spark or timing to one side? Yes it will throw the timing stagger way off. Rita rotor tapers were not made that perfect. You must bias it during assembly to make them exactly the same on both gaps. So... got a degree wheel and checked the cam timing. It was off. When i installed he cam chain I counted links instead of rollers. Waiting on the cam seal so I can install the rotor and time it properly. The intake cam lobe centerline is at 107. Optimum is 102. Will this make much difference on a stock 850? Will advancing the timing help? Cam chain has 18 teeth for 360 degrees, so for one roller that's 20deg @ cam , which makes 40 deg @ crankshaft. Are you sure it is not a gear mesh problem and not a chain problem. Here is profile of 03 dunstall cam installed "straight up"
Dave, I helped Pete with the cam timing, I race Triumphs so I have done a lot of cam timing, but none on Nortons...We are sure the timing is set on the factory punched marks...So you say let it be at 107 for street use? There is no reason to tweek a normal stock cam. You should make a normal 42-45 RWHP if tuned well. If it is a stock cam then it should run fine. If it doesn't then you do have another problem. 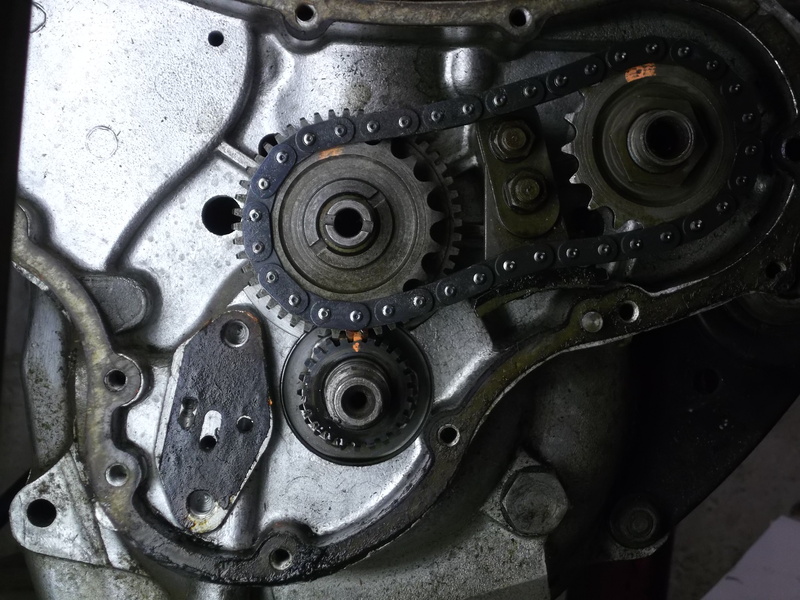 Observing the crank and intermediate gear marking/placement is the most often mistaken and hardest to identify and see. The cam gear marker is 12 deg CCW from straight up...Which happens to be the angle/position of the lifters. This shows the RH valves in overlap and the LH cylinder on compression. Thanks Dave. By gear mesh do you mean the alignment with the crankshaft pinion? We painted the alignment marks and verified they mesh correctly. Yes exactly how we did it this time. So... Reset the cam timing, re-assembled the ignition. Started her up, sounds great. Quick blast up the road and my new bronze exhaust nut starts spinning off so back to the garage. Hillbilly Biker helped me strobe time it and I took off for a short blast. Wow, nice power, everything working well...*^$*^%#$^%bike dies at 80 mph. Starts up again but dies pretty fast. Now I have to push it up a hill to coast back to my house. 3 minute ride. Compression test shows 150 lbs left, 90 lbs right, a seizure on one side. Plugs do not have any aluminum on them so hopefully no metal in the bottom end. the cylinders had a fresh hone and used pistons with new rings already so I just did the valves, etc. I always use a degree disc to set the cam timing and strobe the ignition. And you should know when your motor is jetted too lean. If it coughs or goes like buggery, it is probably too lean. Usually you only get seizures when the main jets are too small. If it is too lean at mid throttle, the bike becomes a pig and coughs, as you change up through the gears, when riding it. With my bike, I know immediately if it is too lean, because I am always aware of how it is performing. Plug color looked fine. 260 mains. I've seized two strokes before but never a four stroke. The acceleration was excellent going up through the gears. No coughing, hesitation, no warning. Then again this was my first ride with correct cam timing. Never rode it before the rebuild.